Lancaster Online reports that a new Amish settlement has been founded in Lancaster County’s next-door neighbor, York County. Why is this news? It’s notable because it’s the first example of a new, more deliberate strategy of creating Amish settlements. Amish have actually lived in York County for quite some time. But these Amish have been considered a part of the greater Lancaster County settlement (which also stretches into Chester County to the east). In fact, Raber’s Almanac actually lists 4 churches in York County, including in the area of Airville, which we’ve featured here regarding the local mud sale. These churches are not too far over the Susquehanna river border separating Lancaster County from York County. This new community is actually geographically more distant, in the area of Glen Rock – about half an hour west of the other York County Amish by car. The Amish say it’s taken hold and is flourishing. There are more than a dozen households, totaling more than 70 people. There are three ministers, so the settlement can hold church services. Glen Rock is in the area of the Markets at Shrewsbury. Long-time readers may recognize this PA Dutch market from previous posts about the market’s “cruise night” and on one of my favorite places to grab a bite, Country Style Deli. This was also where we filmed a piece with CNNMoney on Amish businesses back in 2010. The Glen Rock community was started last year, but does not seem to be listed in the 2017 Raber’s Almanac. 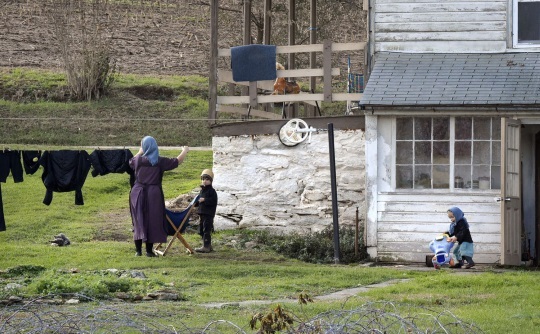 Lancaster’s Amish have founded daughter settlements before. What makes this one different is that it’s a trial run for what scholars of the Amish say is a new idea: A program of well-planned and possibly community-supported migration to help ease population pressure and land scarcity. Up to now, Amish migration from the Lancaster settlement has been “ad hoc,” said Steven Nolt, senior scholar at the Young Center for Anabaptist and Pietist Studies at Elizabethtown College. Historically, “there hasn’t been a communitywide planned strategy” for outmigration. Daughter settlements aren’t hindered, but as Nolt noted, they’ve been “ad hoc,” expected to make their own way. And that exposes them to risks that can lead to failure. There may be unexpected startup costs. Migrants may have less access to the Amish’s staple tools, such as buggies or hydraulic pumps, Kraybill said. Would-be dairy farmers may discover there isn’t an accessible market for their milk. They may clash with township officials over zoning or other ordinances. Internal disputes may arise over how conservative to be, impairing the harmony needed in a small, close-knit community. What’s needed, the Amishman involved in the Glen Rock settlement said, is a program consciously designed to reduce risk. He believes settlements need a minimum of five to 10 families. Then, those families need to sit down and reach agreement on the character they want the new settlement to have. They may lean more or less conservative, but they all have to be on the same page. And the more they can figure out practical matters ahead of time, the better. Only then should they start looking at possible locations, he said. When the discussion does turn to land, one potential advantage of a more systematic approach could be a greater awareness of the broader rural real estate market. Untapped areas could be researched, and if daughter settlements could be established more regularly, spreading demand out over more areas, that would reduce the chance of creating localized real estate price spikes. Economic pressure being one of the most common causes of migration, this is an important point. Land in Lancaster County is likely the highest of any Amish location – up to $30,000/acre. By contrast, York County acreage is cheap – from $7,000 to $10,000/acre. Bill O’Brien, chief lending officer of Bank of Bird-in-Hand, notes that when you pass $10,000/acre, you’ve gone beyond a farm’s income-earning potential. So I think this strategy would be particularly relevant for those Amish still settling in cheaper-than-Lancaster but still relatively expensive areas like York County (versus those further afield, in significantly cheaper areas, such as upstate New York). Besides helping ensure lower land prices for Amish, this approach may actually help with “P.R.” towards non-Amish neighbors – since one of the complaints heard about an influx of Amish settlers is rising real estate prices. In the Lancaster Amish settlement, Nolt said, congregations are largely autonomous, so a settlement support system would have to be created from scratch. Moreover, he said, up to now, the choice to move has been seen as a family or personal decision. It would be a break from tradition for church leaders to start taking a more active role, and deference to tradition is a powerful and important norm. It will be interesting to see how this approach fares. York is a fairly rural county so there is room to expand – albeit in a managed way which seems to be the point of this strategy. If it works, I’d expect to see more Amish from Lancaster and possibly other areas adopting this approach to migration. I recommend reading the article in full here (just need to do a free registration on the Lancaster Online site for access). Hi Mary, I was in touch with Anne some months ago but don’t have an update right now. Maybe Anne will share again at some point or if I’m able to I’ll let you know what I hear. I know several people have been wondering how they are doing and I’m sure your prayers are appreciated! Well put Walter. I usually find this “just because you can do it…” idea really resonates with people, even if most of us don’t live that way, at least regards to technology. I am 39 and when I get into this topic I often say that I’m glad to have been born when I was and able to experience life both before and after the internet/social media/smartphones were popularized. I also wonder what will be the next technological change about which people will say something similar. Shall I confess that I am almost twice your age? 🙂 I pre-date fax machines and color television. I wish I could say that I am personally deliberate about adapting technology– although I do limit my use. Walter I appreciate the “confession” 🙂 I am not of the black and white era though I am sure they were still around, my earliest, or strongest early TV memory was of the little 13 inch Maganavox (or was it a Zenith?) on which I’d watch after school cartoons. “Resistor” I think is an apt description of at least some part of what the Amish do vis-a-vis technology. Nice quote. Now you’ve got me trying to think of other “100 years ago” examples! I commend the Amish for branching out. I would welcome more coming to our area in upstate NY. I am a farm owner and land is much more affordable. In general $5000 and acre. We don’t need more mini malls and condos. We need more working farms with families who are willing to put in the blood sweat and tears required to do this kind of work. Erik — Really enjoyed this article. Great stuff for all of us to contemplate here about how community is formed. The “culture first, real estate second” is powerful advice. Amish in Glen Rock, York Co. I live on the same street that David and Mary Yoder and their children live in Glen Rock. They are the first family who migrated to this part of York Co. We quickly became friends. I helped out for a year as a driver for the school teacher as well as for other Amish families who have since moved here. We love having the Amish as our neighbors and I look forward to more Amish families migrating to our area. Thanks for sharing Vincent, and neat to hear you’ve had a hand in helping the new community! I can say that this is not only an interesting, but also encouraging development. When we spent a week in Lancaster County this past summer for Horse Progress Days the one impression that I got; after driving the backroads on our own for several days and then taking the HPD bus tour is that those Amish and OOM areas are so densely populated that many of the farmsteads are practically stacked one on top of the other. We did venture down into Chester County and while it didn’t seem to be so densely populated, it did not strike me as being a particularly promising area for Old Order growth. We wanted to get over to York County, but that never happened. I wish now that we had. The idea that they are taking a more systematic, process oriented approach to settlement is a positive sign that they are taking the issue very seriously. Generally when things are done on an ad hoc basis, the results can be vary widely. BTW: For some reason or other, I also especially enjoyed the comments on this story. Not that I don’t usually, but today they just resonated with me for whatever reason.